The latest update to djay Pro now lets you use Pioneer CDJs to control the app as well as to make use of the CDJs' onboard audio interface. The latest update to djay Pro now lets you use Pioneer CDJs to control the app as well as to make use of the CDJs’ onboard audio interface. In a major upgrade to its djay Pro platform for Mac, Algoriddim has added comprehensive support for Pioneer CDJ and XDJ models; live video mixing; and a host of other features, helping to make djay Pro a serious alternative for use in pro DJ booths. In an update that feels more like a 2.0 than a 1.1, the platform now supports Pioneer’s CDJ-900, CDJ-2000nexus, and XDJ-1000 models (note: no CDJ-850), including using those units’ internal audio interfaces. 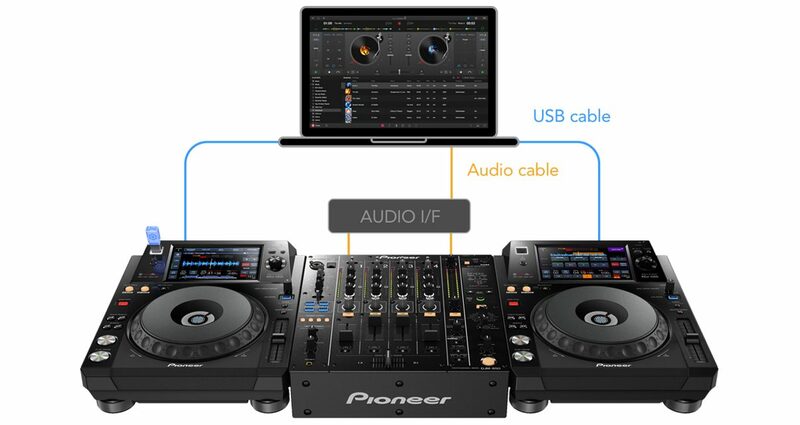 That means that the djay Pro 1.1 DJ can now connect to a club’s existing system with just two USB cables for full integration. Not only does that mean that waveforms, song info, and cue points will all display on club-standard Pioneer equipment, but slip mode, pitch bend, looping, master tempo, and library navigation are claimed to all work as expected. Most excitingly, as Spotify is baked into djay 1.1, this means you can DJ on Pioneer gear just as easily using Spotify as you can using your iTunes local library, something especially good due to the fact that as of djay 1.1, Spotify can be used in higher resolution 320kbps mode for better audio quality. 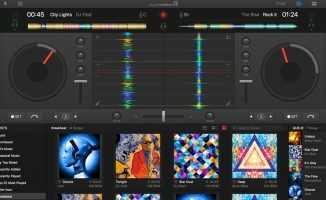 Algoriddim has said that it has finally made jogwheel performance on par with the best out there (a long-time request of ours), and that it’s now possible for the first time to browse for music outside of your iTunes collection from within the software. Other browser / library improvements are the addition of a history section to keep track of what you’ve played as well as a recommendation engine, the latter presumably working by finding tracks within a BPM tolerance and in a compatible key (although we haven’t tested this yet). 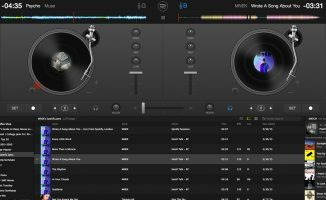 Algoriddim says the software now works better with a wider range of controllers, although the names they state aren’t the best selling models, being two older Numark controllers and the existing Denon range at the time of this writing. It’s now possible to mix videos in djay Pro 1.1, giving VJs a new platform to try. There is stuff we need to test here, namely the jogwheel performance improvements, how well 320kbps Spotify integration works and sounds, and any limitations of the Pioneer integration, particularly any compromises to make Spotify work on that hardware – but overall, this is an exciting development, as it’s the first time a major DJ platform has allowed streaming music to be played on pro DJ booth equipment. That alone is currently a huge unique selling proposition for djay Pro 1.1. 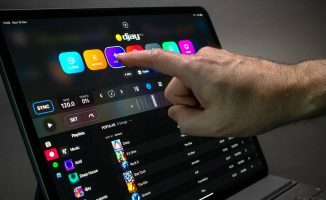 The biggest obstacle holding back serious DJs from using djay Pro 1.1 with Spotify in a professional situation is still the lack of being able to play from a local Spotify offline library, as it introduces a level of inconvenience and uncertainty into DJing audio from a streaming service. Not only do you need to be online for it to work at all, but there are glitches that are unacceptable in a performance station, the biggest of these is the dreaded “this song is not available in your territory” limitation – one that’s especially annoying as such songs still show up in searches. This still needs looking at. Overall though, while djay Pro 1.1 has a fraction of the market share of Serato and Traktor, neither program has made big inroads into the DJ booth, making that playing field a lot more level when pitched against Pioneer’s own Rekordbox platform. In adding video, the program catches up with Serato DJ in that area too, and since djay Pro 1.1 is the only Mac-focused platform out of all the DJ apps out now, that fact alone has always given Apple fans a big reason to use it over any other; now it just got a lot more appealing for many other types of DJ, too. 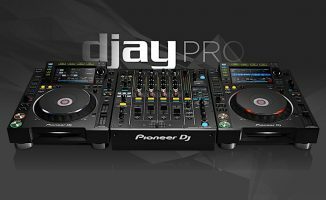 Check out the promo videos below to see djay Pro in action. 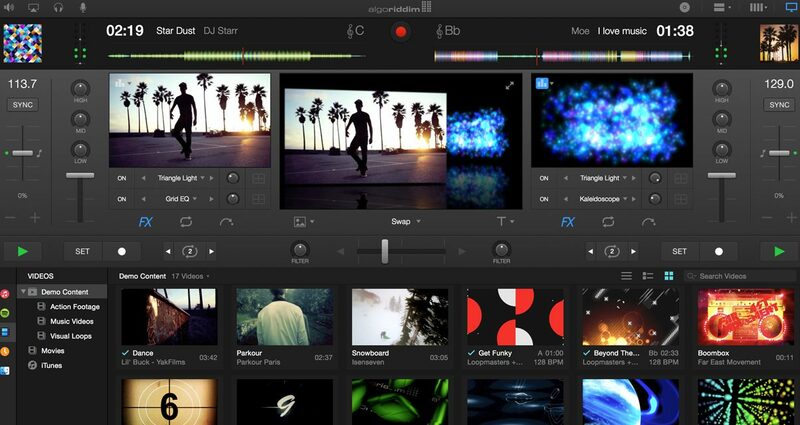 • djay Pro 1.1 is a free update for existing users and works on any Mac running OS X ￼10.9 or later. It is available on the Mac App Store for $49.99. Find out more from the Algoriddim website. A free trial is available here. 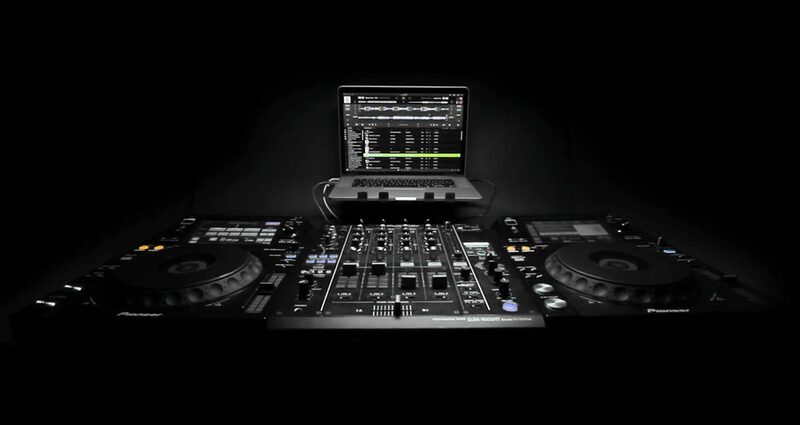 Does this make you want to try out djay Pro? Will music streaming be the future for DJs? Let us know your thoughts below. Great article Phil! We worked very closely with Algoriddim to add native support for 3 existing Denon DJ controllers. Once djay Pro 1.1 is available owners of the SC2000, MC6000, MC2000, and MC6000MK2 will now have plug and play support. We are very exciting about this release! US App Store still showing V1.0.2. Any idea when 1.1 will become available? Love this software? Normaly I use a DDJ-SX and Traktor but sometimes at smaller gigs I bring my Vestax Spin2 and Djay pro. What puzzels me is that the Vestax/Djay combination sounds SO much better. It sounds like changing from mp3 to vinyl. Must be something in the software I guess…. Just waiting for mapping for my SX or RX….. I can’t speak on cdj’s but I have mixed in a club with Djay Pro and these are, basically, all the changes I was wishing for. The only thing not mentioned that I’m hoping for is the ability to set the cue buttons to play the song from the cue point. Overall, I’m stoked on all these changes. Did they give a release date for 1.1? As of this posting it’s not available on the Mac App store. Version 1.1 hit the app store here in the UK last night (24/04/15). Looks good. Has anyone else noticed that playing songs from spotify in this version puts a huge load on the CPU?